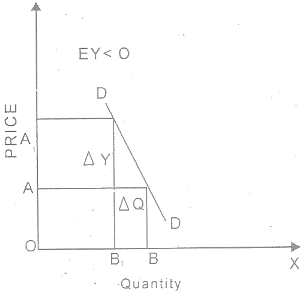 The percentage change in quantity demanded due to percentage change in income is called income elasticity of demand. Income elasticity of demand measures the responsiveness of demand for a good to change in income of consumer. When income of people increases they like to buy more of the goods. The concept of income elasticity gives an idea about essential and non essential-goods. Luxury goods have high-income elasticity. People buy such goods and large part of income is spent. Necessities of life have low-income elasticity. Part of income spent on soap, matches fall as the income of people increase. D.S. Waston says that income elasticity of demand means the ratio of the percentage change in the quantity demand to the percentage change in income. Ey means income elasticity of demand. ΔQ is the change in demand. Q is original demand. Y is original income and Δy change in income. Suppose the income of a person is $2000 and he purchases 20 liter of milk. If his income increases to $2500 he purchases 30 liter of milk. Therefore income elasticity of demand is is 2000 divided by 500 multiplied by 10 divided by 20 and result is 2. It means demand for milk is income elastic. Increase in income increases the demand for luxury goods in rich countries. The percentage change in demand is greater than percentage change in income. The change in demand for necessities of life is low. Increase in income increases demand for necessities of life in poor countries. The percentage change in demand is greater than percentage change in income. The change in demand for luxury goods is low. There is unity income elasticity of demand when percentage change in demand is equal to the percentage change in price. The demand curve for this income elasticity has upward slope. The increase in quantity demanded is equal to increase in income. The demand for commodity increases by 20% while increase in income is 20%. 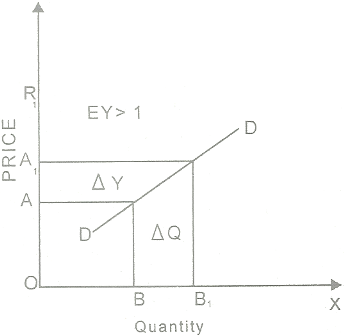 The diagram shows that increase in demand is equal to increase in income. 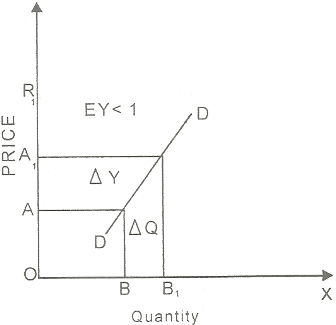 It is a case of unitary income elasticity of demand or Ey = 1. It takes the shape of 45 degrees. The income elasticity is greater than unity when percentage change in demand is greater than percentage change in price. The income of a consumer increases by 20% and demand for commodity increases by 40%. 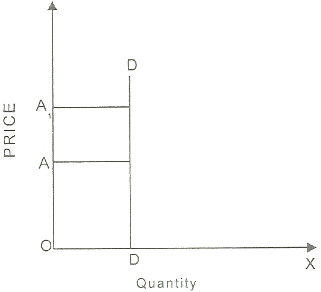 The diagram shows that quantity demanded is more than rise in income of consumer. It is a case of income elasticity of demand is greater than unity or Ey = 1. The demand curve in this case is flatter. The income elasticity is less than unity when percentage change in demand is less than percentage change in price. The income of consumer increases by 20% the demand for commodity increases by 8%. The diagram shows that increase in demand is less than increase in income. The income elasticity of demand for commodity is less than unity or Ey = < 1. The income elasticity is less than one. The demand curve for this case is steeper. There is zero income elasticity when demand remains unchanged due to change in income in any direction. The income of a consumer increases (say) 20% but there is no change in demand for commodity. The diagram shows that quantity bought remains constant regardless of the rise in income of consumer. The demand curve for zero income elasticity is vertical straight line. It is a case of zero income elasticity of demand or Ey = 0. There is negative income elasticity when increase in income brings decrease in demand. The consumer can reduce his purchase of inferior commodity when there is increase in income. The demand for commodity decreases by 8% while there is increase in income by 20%. The diagram shows that less is purchased at higher income. It is a case of negative income elasticity of demand or Ey < 0. The demand curve in this case has downward slope. Income elasticity is positive for normal type of goods. When there is increase in income there is increase in demand for these goods. In case of decrease in income there is decrease in demand for these goods. The examples of these goods are shampoo, soap, and toothpaste. When income elasticity is negative the commodity is inferior. The pulses are inferior goods as compared to meat. Increase in income brings decrease in demand for such goods. Income elasticity is zero for cheap or natural type of goods. Increase in income does not affect the demand for goods like salt, newspapers, matches, and postcards. When income elasticity is positive and greater than one the commodity is luxury. The demand for cars, jewelry, and television is highly income elastic.